Lovecraft defined and popularized cosmic horror in the early twentieth century. The notion that our feeble existence is of little consequence within a greater universe filled with alien god-like beings is both terrifying and fascinating. To this reality were born Cthulhu and Nyarlathotep, among other elder monstrosities. Since this time, cosmic horror has proliferated as a subgenre. Some have added to Lovecraft’s “Cthulhu Mythos”, while others have focused on developing their own cosmic realities and the beings that inhabit them. Brian Keene has done both, expanding and modifying Lovecraft’s original concepts into a much larger pantheon developed from his own imagination. 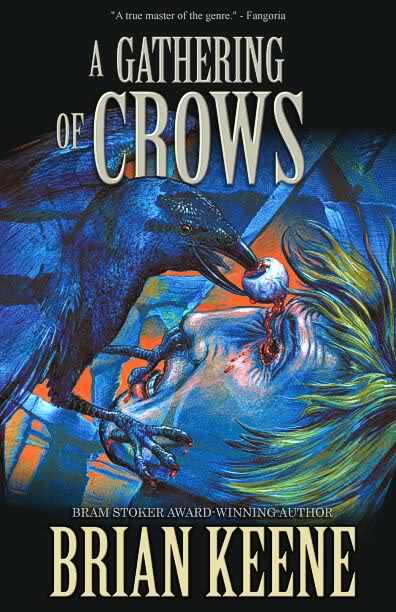 A Gathering of Crows is cosmic horror born out Keene’s pantheon. Servants of the being known as Croatoan, or Meeble, have descended on the unsuspecting town of Brinkley Springs. These creatures wield strong magic and have the ability to shape shift into the form of a crow. They are intent on destroying the town and devouring the souls of all those who reside in it. However, fate has sent another to Brinkley Springs to stop them. A former member of the Amish and powerful magician, he goes by the name of Levi Stoltzfus. To fans of Brian Keene, Levi Stoltzfus is well known. First appearing in Ghost Walk, Levi has been mentioned in several novels and is featured in Keene’s most recently published story, Last of the Albatwitches (September 1, 2014). He is one of the few good guys running amok in horror literature today. A modern Solomon Kane or Abraham Van Helsing, Levi takes the fight to the creatures which lurk in the shadows only to come out victorious time and time again. However, Levi Stoltzfus is not the only reoccurring entity in the novel. References to almost all of Keene’s previous works abound in this tale. If you have read The Rising or Earthworm Gods, expect some old faces to show back up. A Gathering of Crows is, in many ways, homage to Keene’s earlier stories. It is a standalone novel. No previous readings are required to enjoy the story. Yet, like Lovecraft’s “Cthulhu Mythos”, A Gathering of Crows is part of an interconnected web of tales and worlds created by the author. To fully consume the novel, one must understand the entirety of the universe developed by Keene. As a result, it is hard to recommend A Gathering of Crows as an introduction to his writings. Neophytes are better directed towards Ghoul or The Rising. These novels share with A Gathering of Crows an easily accessible writing style and clever character driven storylines, but lack the myriad of references to other works. Moreover, while the story presented in A Gathering of Crows is good, it isn’t great. Much of the love readers will feel towards the narrative is born from the nostalgia and references to other tales written by the author.